Probably! But right now it is their objectness that I’m obsessed with. I have not confirmed with Roden if these are the same pieces, but in 2011 a Presidential Relics sale at Heritage Auctions in Dallas included five separate lots of coffin fragments as part of a large collection of Washington-related material. I have reordered the descriptions of these five lots for narrative flow. 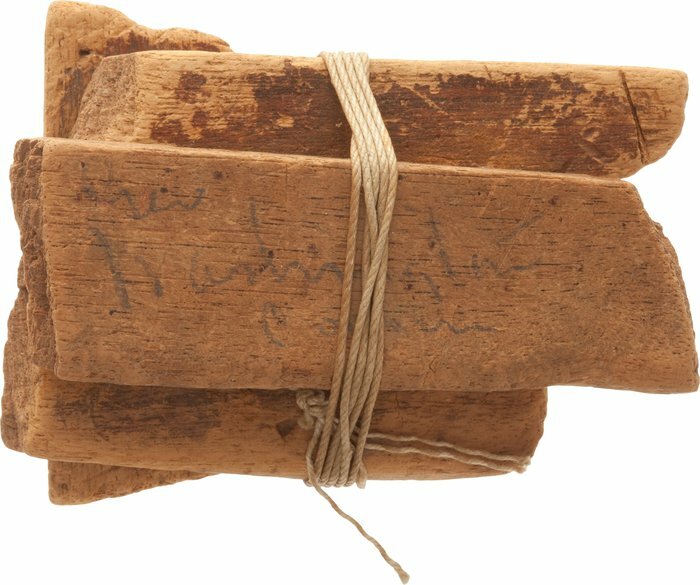 Lot 38020: George Washington: Relics from His Original Coffin (5 Items). Nearly 40 years after his death in 1799, Washington was reinterred at Mount Vernon. His body was transferred to a new coffin, as the old one was already significantly deteriorated. 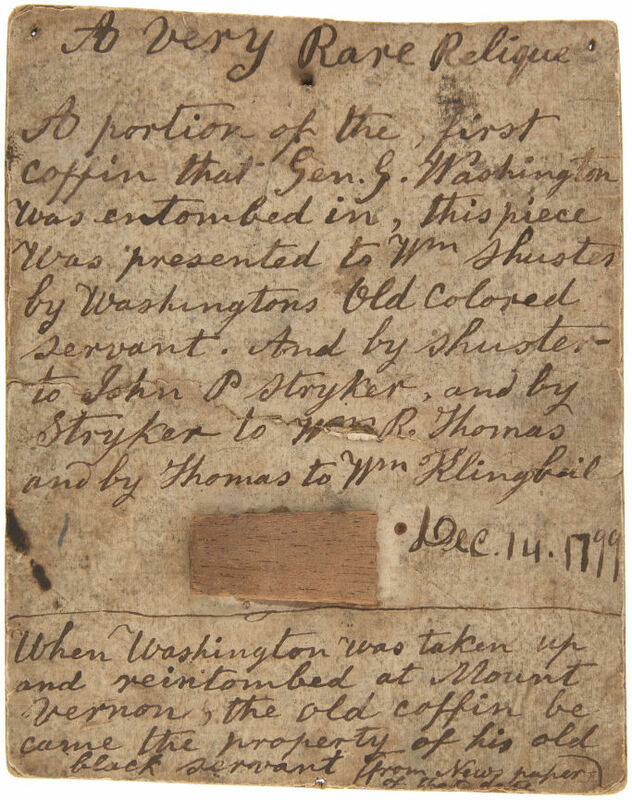 The Washington family saved a significant part of the coffin, and for generations passed out small pieces as souvenirs to friends and well-wishers. 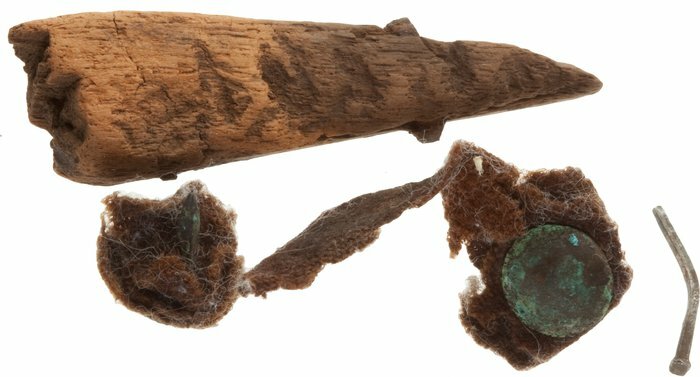 This lot, consigned by a direct descendent of Bushrod Washington, consists of two tacks, two leather fragments, a small nail, and the piece of wood measuring 2.25″ in length. A letter of provenance from the consignor accompanies this lot. Lot 38019: George Washington: Three Larger Pieces from His Original Coffin (3 Items). Larger and more regular in shape than the typical fragments that show up from time to time in the market, often with contemporary notes. One carries the apparently very old pencil attribution “Gen Washington’s coffin.” These three are bound together by what clearly appears to be original 19th-century string. Sizes: 2″ x 2.5″, 3″ x 2.125″, and 3.25″ x 1.125″ respectively. Accompanied by a letter of provenance from the consignor, a direct descendent of Bushrod Washington. 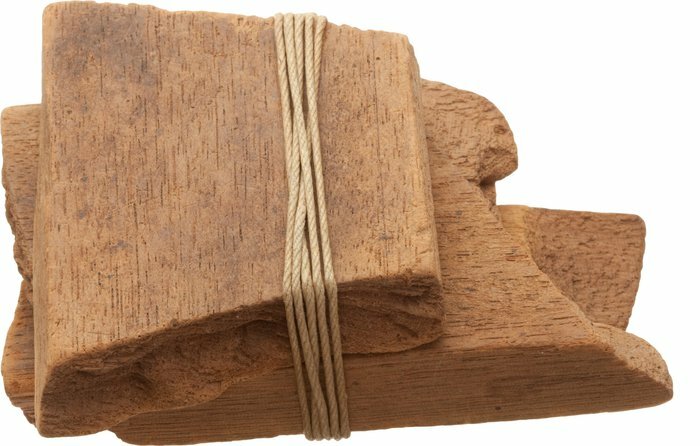 Lot 38018: George Washington: Three More Wood Fragments from His Original Coffin. (2 Items) One of them still has the original 1.75″ screw running through it. Like the handle, the screw is heavily corroded, demonstrating the ravages of moisture which contributed to the decision to reinter Washington less than 40 years after his original burial. The lot consists of a 3.5″ by 0.75 inch piece, a 2.5″ x 0.75″ piece, and a 2.5″ sliver. Like the adjacent lots, this group has been consigned by a direct descendent of Bushrod Washington, and is accompanied by a letter of provenance. 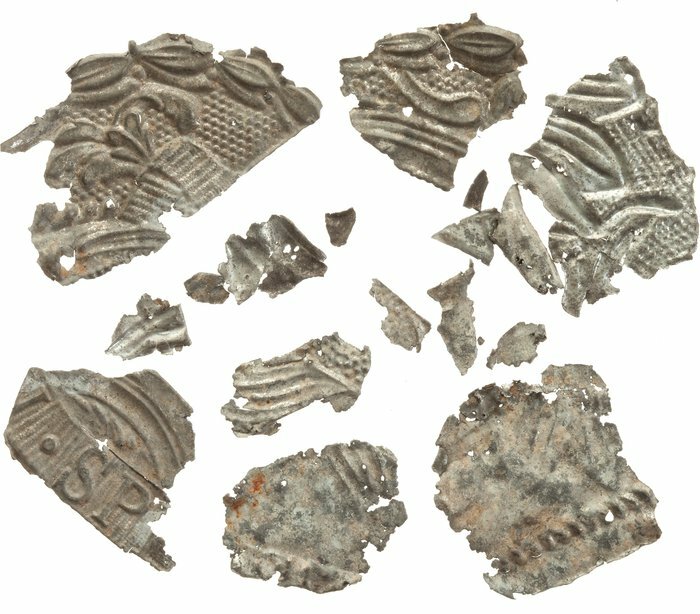 Lot 38021: George Washington: Fragments of Embossed Decorations From His Original Coffin, As Shown (17 Items). Much more unusual than the wood fragments, which are the most commonly seen relics of Washington’s coffin. Like the other lots in this section, they are consigned by a direct descendent of Bushrod Washington and accompanied by a letter of provenance. Shown to scale, with the largest measuring 2.25″ x 1.25″. 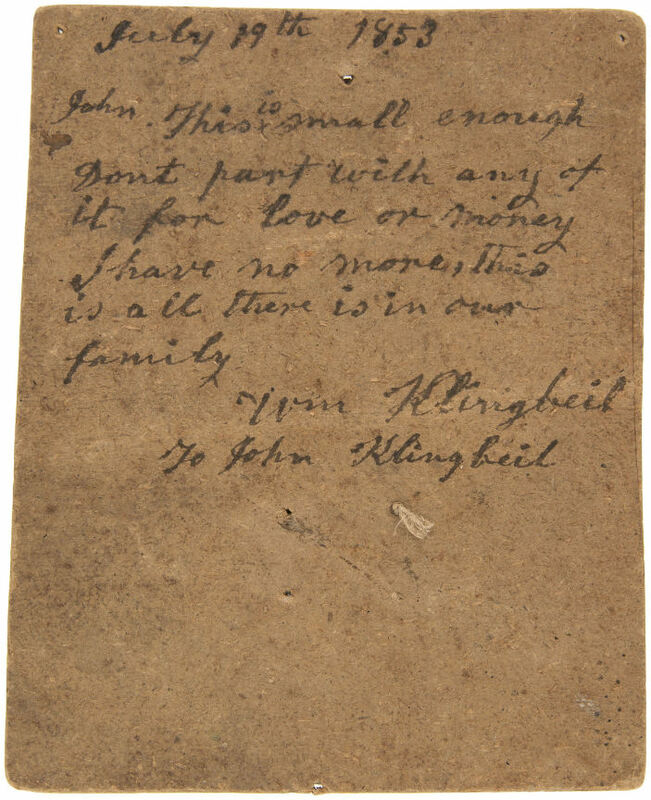 The Washington family saved a significant part of the coffin, and for generations passed out small pieces as souvenirs to friends and well-wishers. Much more unusual than the wood fragments, which are the most commonly seen relics of Washington’s coffin. Far rarer than the wood fragments, which were distributed as keepsakes for generations by the family. a direct descendent of Bushrod Washington, into whose control Mount Vernon passed after Washington’s death. Bushrod was George & Martha’s nephew, and a US Supreme Court justice. He inherited Mount Vernon along with all of his uncle’s papers and property, including little cash and no slaves, after Martha’s death in 1802. Until 1831, all the Washingtons were buried in what’s called the Old Tomb. There were calls to move George Washington’s remains to the base of a monument, or to the base of the US Capitol. Instead he and Martha were reinterred in the New Tomb, or The Tomb, as he had originally instructed in his will. The original coffin was mahogany, which dropped into a lead sarcophagus. Bushrod died in 1829, with no kids. [So technically, there is no direct descendant of Bushrod Washington.] His estate went to his own niece and nephews, including John Augustine Washington, Jr., who sold Mount Vernon to the Mount Vernon Ladies’ Association in 1858. When, where, how and by who were the fragments of the coffin distributed? Were they chopped up? Sawed off? Was there a big bowl full of fragments you could pick one out of on the way out the door? Did this Bushrod Batch constitute what was left over, or what was kept and treasured? What was it like to be in a family where your tradition was if you really liked someone you gave them scraps of your great-great-great uncle’s coffin? Did the first generation get big piles, which they had to make last, or did they get big pieces, which their heirs proceeded to break down into smaller and smaller slivers? Did the family document them, sign them out? Did they write it in the family Bible? When was the last fragment of George Washington’s coffin given as a keepsake or souvenir, and when was the first one sold as a collectible? How many fragments are out there? And the real question: how badly do I want to put together a catalogue raisonné? Because refabrication, performance, and video have all been eliminated as options from the strategic artistic response list. 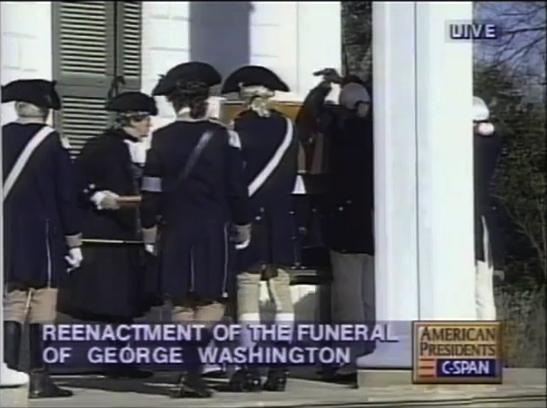 On December 18, 1999, for the 200th anniversary, Mount Vernon staged a re-enactment of George Washington’s funeral. CSPAN covered it live, for two-plus hours, with eight cameras. 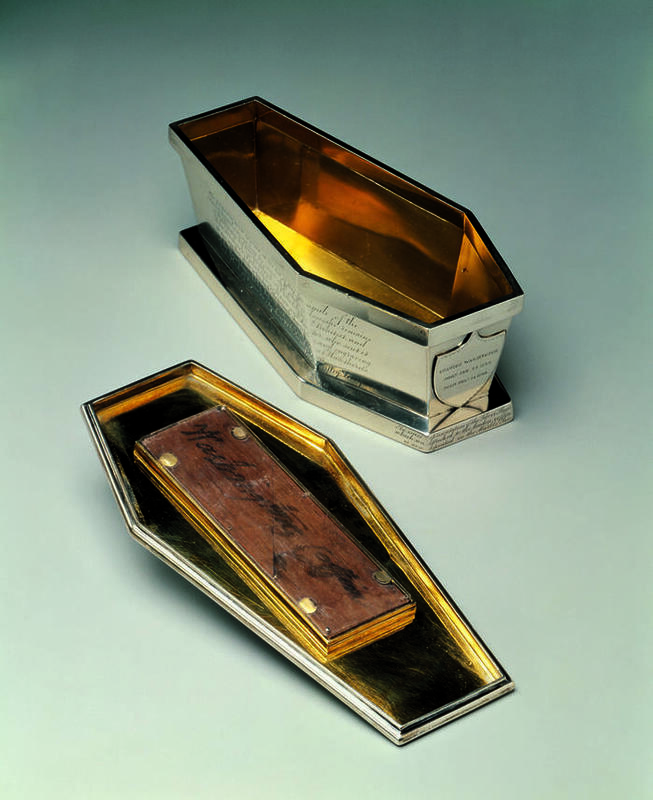 They also created replicas of Washington’s original coffin (top) and sarcophagus (bottom). By process of elimination, then, I am left with one choice: to track down all the fragments, bring them together, and reassemble them into George Washington’s original casket. So far I’ve found one. 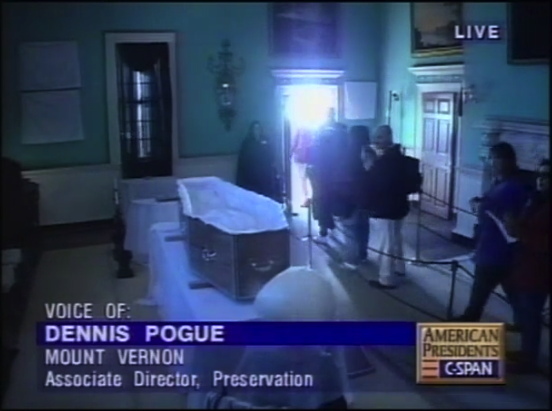 In 2000 Mount Vernon acquired a fragment of the coffin, that had been placed in a silver reliquary shaped like Washington’s new marble sarcophagus. 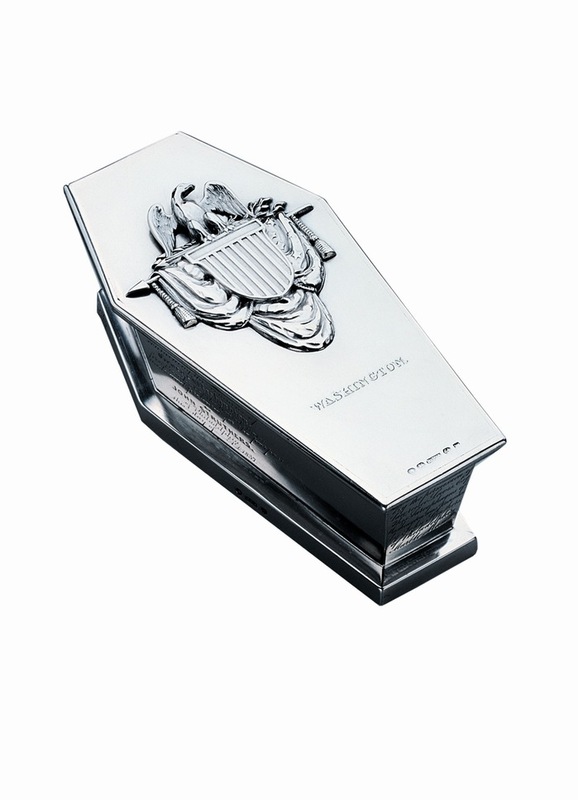 It was given to Jesse Hartley, a Liverpool businessman who had helped the sculptor of the sarcophagus emigrate to the US. The portion of wood inserted in the lid of this facsimile of the/ Sarcophagus, was cut from the inner shell which encloses the remains/ of Washington, by Wm. Strickland, of Philadelphia, Architect, and/ John Struthers, of Philadelphia, Mason and Sculptor, who sent it/ to me, together with a printed historical description and engraving/ of the Sarcophagus, etc. But why wait? It was just a year ago I made a piece of a to-be-reunited set of Agnes Martin prints. The fragments are what they are wherever they are, objects as real and as in the world as the pieces of Danh Vo’s Statue of Liberty. At least I’d think so. What if all the fragments of Washington’s Coffin turn out to weigh more than the actual coffin, like how Calvin said there are enough fragments of the True Cross to build a ship? Maybe it can be an edition. Oh wow, this is getting complex. The old article with that “purported” piece said the coffin was black walnut. Last year Hake’s handled a piece of the coffin with a note attached, a fourth-hand account that, “When Washington was taken up and reintombed at Mount Vernon the old coffin became the property of his old Black servant (from newspaper of that date)”. Which they think might be a reference to William “Billy” Lee, the only enslaved person Washington freed in his will. But Lee died in 1828, three years before the tomb switch.